Congress on Thursday slammed Pakistan Prime Minister Nawaz Sharif for his Kashmir shouting and glorifying terrorist Burhan Wani at the UN. It said External Affairs Minister Sushma Swaraj should give a strong and a befitting reply when she addresses the world body on Monday. The main opposition party said the government should put up a strong and factual case for India in front of the International community and wanted Prime Minister Narendra Modi to consult all political parties before deciding on "concrete and tangible steps" in the wake of the Pakistani onslaught. "Conspiratorial omission to Uri Attack in Sharif’s speech is a public admission of culpability by Pakistan, of its direct involvement in this act of cowardice. There was nothing new in his address, except glorification of terrorists and extremism which Pakistan has adopted as 'state policy'," Congress' chief spokesman Randeep Singh Surjewala said here. In "glorifying" a terrorist like Burhan Wani, a Hizbul Mujahideen commander who was killed in an encounter with security forces on July 8, Sharif only reiterated where his and his country's sympathies and support lies, he added. "The international community must now understand fully that it is not only terrorists in Kashmir that Pakistan supports but its state policy is to provide an umbrella support and sustenance to all those who wreck havoc across the world, including in France, Bangladesh, USA, Britain and Belgium......," he added. "We are confident that an already wary international community has seen through Pakistan's vile designs", he said. Surjewala ridiculed Sharif's claim of an 'intifada' (uprising) in the Kashmir valley and said his "conspiratorial omission" to Uri Attack is a public admission of guilt. "In citing 'intifada' in Kashmir, Nawaz Sharif looks like that emperor who plays flute while his entire country, right from Khyber to Balochistan to Sindh is up in a violent intifada against his nation state," the Congress leader said. Describing Pakistan as a 'renegade state' that has emerged as the 'central processing unit' (CPU) of global terror, he said in what has now become habitual; Sharif again invoked Kashmir at a multilateral forum, despite Pakistan being a signatory to the Shimla Accord. 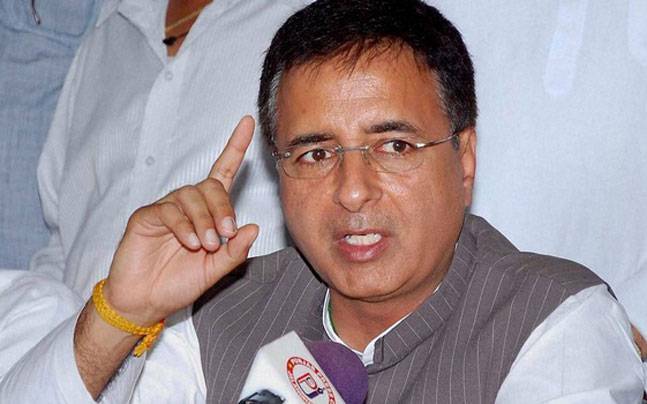 Surjewala said the Modi government has "followed" the Congress-UPA's policy in raising the issue of human rights violations in Balochistan and now it is imperative for India to sensitize the International Community and the UN with this issue. "We urge upon the Prime Minister and the government to consult all political parties in taking a concrete and tangible step on this," he added. While expecting Swaraj to give a befitting reply to Sharif's speech at the UN General Assembly, Surjewala took a jibe, saying this is imperative as the External Affairs Minister was not present in nearly all the initial meetings held to assess the situation and review security chaired either by Prime Minister or other Ministers.